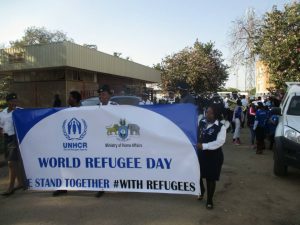 One rainbow nation, Malindza Refugee Reception (MRC) pre-school children recited these words during the school’s 2017 graduation ceremony held MRC hall. Through the poem the children preached: unity; love and peace as they concurrently waved flags of a number of African countries. 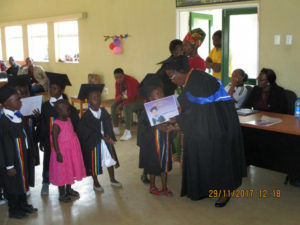 Members of the Swaziland Council of Catholic Women presenting gift packs to heads of households at Malindza Refugee reception centre at the end of the World Refugee Day commemoration ceremony. Refugee Youth ready to make a difference!